Researchers develop non-invasive electronic wound-healing technology. Bacterial resistance is a growing problem around the world. While antibiotics were a miracle drug of the 20th century, their widespread use has led to drug-resistant strains. In the U.S. at least two million infections and 23,000 deaths are now attributable to antibiotic-resistant bacteria each year. When doctors use antibiotics to treat a bacterial infection, many of the bacteria die, however, bacteria that form a slime layer, known as a biofilm, are more difficult to kill because antibiotics only partially penetrate this protective layer. 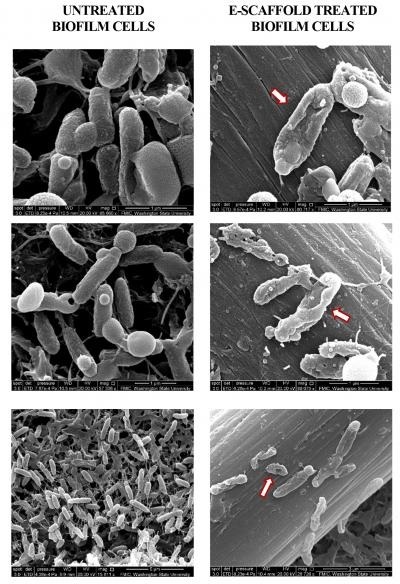 Subpopulations of ‘persister’ cells in these biofilms survive treatment and are able to grow and multiply, resulting in chronic infections. Now, a study from researchers at Washington State University uses a mild electric current to take on and beat drug-resistant bacterial infections, a technology which may eventually be used to treat chronic wound infections. The team state that they used an antibiotic in combination with the electric current to kill all of the highly persistent Pseudomonas aeruginosa PAO1 bacteria in their samples. The opensource study is published in the journal npj Biofilms and Microbiomes. Previous studies show that biofilms in chronic wounds are known to contain a persister subpopulation that exhibits enhanced multi-drug tolerance and can quickly rebound after therapeutic treatment. The presence of these persister cells are partly responsible for the failure of antibiotic therapies and incomplete elimination of biofilms. Electrochemical methods combined with antibiotics have been suggested as an effective alternative for biofilm and persister cell elimination, yet the mechanism of action for improved antibiotic efficacy remains unclear. The current study uses an ‘e-scaffold,’ a sort of electronic band-aid made out of conductive carbon fabric, along with an antibiotic to specifically tackle these persister cells. The current study develops an e-scaffold whose electrical current produces a low and constant concentration of hydrogen peroxide, an effective disinfectant, at the e-scaffold surface. Results show that the hydrogen peroxide disrupts the biofilm matrix, damages the bacterial cell walls and DNA, allowing better antibiotic penetration and efficacy against the bacteria. Data findings show that change in bacterial cell morphology after e-scaffold treatment was observed using scanning electron microscopy (SEM). The lab state that they utilised P. aeruginosa PAO1, the bacteria responsible for chronic and serious infections in people with lung diseases, such as cystic fibrosis, and in chronic wounds. The group isolated persister cells from PAO1 biofilms and then worked out the conditions necessary for the electrochemical reaction to produce hydrogen peroxide. Results show that the current has to be carefully controlled to assure the correct reaction at an exact rate. Data findings show that their method doesn’t damage surrounding tissue, and the bacteria are unable to develop resistance to such an electrochemical treatment. The team surmise that they have successfully developed an e-scaffold which enhances tobramycin susceptibility in P. aeruginosa PAO1 biofilms. Moreover, the e-scaffold eradicates persister cells in biofilms, leaving no viable cells. For the future, the researchers state that based on these observations, a possible mechanism of e-scaffold enhanced antibiotic susceptibility is proposed and a future mechanistic study is suggested. Washington State University researchers have successfully used a mild electric current to take on and beat drug-resistant bacterial infections, a technology that may eventually be used to treat chronic wound infections. Credit: Washington State University.